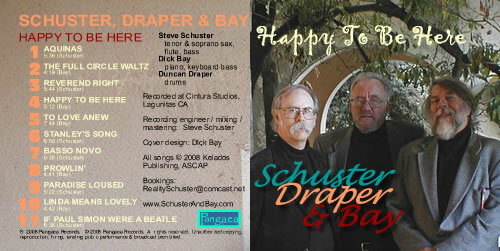 Available Now : "Happy To Be Here"
For their first CD, Schuster, Draper & Bay have assembled eleven original tunes that recall a time when melody mattered in music, when harmonies were sophisticated and the rhythms supple. The group performs an eclectic mix of styles, ranging from bebop to gospel to ballads to bossas. Tasteful and engaging, creative and passionate, Happy to Be Here is a fresh and satisfying musical treat you won't want to miss.